Wappingers Falls MMA classes are available at Precision Mixed Martial Arts. With classes 7 days a week in MMA, Boxing, Muay Thai Kickboxing, Brazilian jiu-jitsu, Judo and Wrestling there is something for everyone at Precision. You don’t need to be in great shape to train at Precision since there are classes for every experience level from people in their 40’s just trying to get a workout to elite professional UFC fighters and everyone in between. If you live in Wappingers Falls, NY and have ever thought about training MMA don’t miss this exciting opportunity. 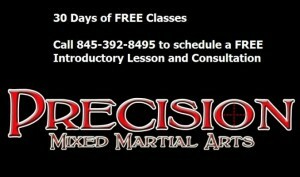 Precision MMA is now offering 30 days of FREE Wappingers Falls MMA training call 845-392-8495 or visit http://www.poughkeepsiemixedmartialarts.com to get started.